Instantly recognizable with their tall bodies and long necks, giraffes roam the plains in eastern and southern Africa. In an area where exotic wildlife thrives, giraffes serve a vital role in the local ecosystem. Their necks are instrumental in much of this niche, influencing what the giraffes eat and what they see. 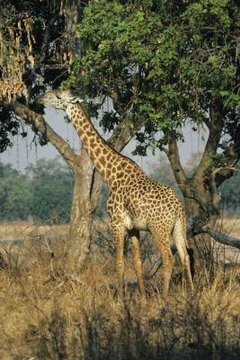 The long necks of giraffes help them eat leaves, flowers and fruit that are higher than most grazing animals can reach; only elephants can compete for food at the same level. This allows giraffes to live in harmony with other herbivores. Without competing for the same food source, other animals don't need to be concerned about the presence of giraffes. The tall mammals eat a variety of plants, but their favorite food is the leaves of the acacia trees. Their lives are so intertwined with acacias that some acacia species only germinate after the seeds pass through a giraffe's digestive system. Birds don't prey on giraffes, but giraffes provide food, especially for oxpecker birds. Ticks enjoy feasting on the blood of giraffes, and oxpeckers like to eat the ticks. They perch on the necks and shoulders of giraffes and pick off the tasty morsels. The birds help the giraffes by removing the pests, and the giraffes help the birds by giving them a safe place to roost while they eat while providing them with nutritious meals. It's not uncommon to see prey animals of different species stick close to giraffes, and it's not just because giraffes don't need to compete with these animals for food. Their tall necks and excellent vision allow them to see long distances; they can spot predators such as lions and hyenas from far away as the predators creep through the tall grasses of the plains. Many animals consider giraffes their early warning system; when giraffes start running away, other animals follow suit. Adult giraffes don't have many successful predators, but baby giraffes fill an important niche as prey. Adults are too big for most predators to tackle, and they pack quite a kick with their front hooves. Baby giraffes, however, suffer a high mortality rate -- around 50 percent, according to the Maryland Zoo. Weighing in at about 110 pounds, even a newborn giraffe is a hard-earned meal for a lion, leopard, crocodile or hyena pack.